Exclusive Sun Microsystems on Thursday announced that it purchased Hewlett and Packard for a little over $6,000. 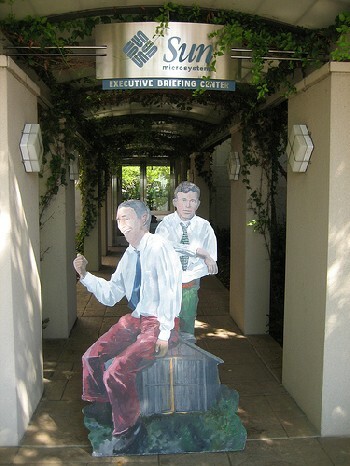 In a crafty public relations stunt, Sun has acquired a wooden sculpture of Bill Hewlett and Dave Packard and decided to send the object on the road to find HP's "sense of humor." A local artist had offered the Hewlett and Packard sculpture, which is part of a larger collection, to HP corporate, but the company passed. So, Sun stepped in with $6,000 and bought the Silicon Valley legends. The Hewlett and Packard figure is part of the Silicon Valley Hitchhiker series that we've been covering for the past couple of weeks. Local artist Julie Newdoll teamed with Jim Pallas, Mike Mosher and Mario Wolczko to create and promote five sculptures of Silicon Valley icons - Fred Terman, Bob Noyce, Hewlett and Packard, William Shockley and Lee de Forest. The figures have been "hitchhiking" around the country with GPS units strapped to their backs so people can follow their journeys online. Each sculpture has a message on its back telling people where it would like to go. Terman, for example, has been making his way from MIT to Stanford. You can catch the full hitchhiker experience here. Thanks to Register readers and others, the Hewlett and Packard sculpture has been travelling around Silicon Valley for the past few days. It visited the Lick Observatory, the HP Garage, the Computer History Museum and Halted Specialties Company. Ultimately, the figure made its way to HP's headquarters in Palo Alto where it met with an, er, modest welcome. "It saddened me that HP refused to even let Hewlett and Packard into their lobby," Newdoll says on the Hitchhiker's web site. "HP has two portraits of our founders, Bill Hewlett and Dave Packard, in the HP lobby, and anything further is superfluous," HP corporate told the SF Chronicle . Not so, according to Sun. "It is a shame that HP chose not to celebrate its own founders as part of this innovative living art project which allows the community to participate," said Larry Singer, an SVP at Sun. "We're working with the organization YLEM - Artists using Science and Technology - and project coordinator Julie Newdoll as we continue to track their fun and fascinating journey." Singer then became less subtle. "By abandoning HP-UX, HP has proven they just don't care about their legacy customers," he said. "I suppose it's only fitting they'd abandon their inventive founders, as well - so just as we're rescuing their customers with Solaris, the world's fastest growing open source operating, even running it on HP's own x64 hardware, we figured we'd rescue Bill and Dave, too."